Clematis Mon Amour is an amazing, medal winning new introduction that stands out for it beautiful dark flower colour, nice flower shape and remarkable flower buds. 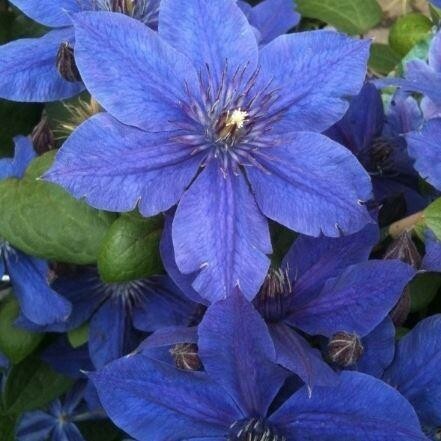 Clematis Mon Amour will reach up to 2 metres tall, with upright stems clothed in dark green foliage. This is smothered with beautiful flowers that reach a diameter of up to 10cms. The colour is a sumptuous deep blue-violet to purple-violet with more purple in the middle. The flower buds are a remarkable dark violet, and the plant is covered in its blossoms from early summer to the first hard frosts of winter. Why not try it displayed clambering magnificently up through a climbing Rose? Supplied in approx 2-3 litre containers. For beautiful colours, extravagance of blooms, and graceful habit, nothing compares with Clematis, the queen of the flowering vines. Whether used on posts or fences, clambering through shrubs and trees, or following wire frames in borders, they will enrich any landscape.